PGA Tour Veteran and FlightScope Advisory Board member Larry Rinker started playing the game of golf at the age of 6. He received a full golf scholarship to the University of Florida where he won the Doug Beldon Award (Most Outstanding Graduation Athlete, Univ. of FL), was named two-time ALL-SEC, and became Southeastern Conference Champion. In 1980, Larry won six tournaments and was voted mini-tour player of the year by GolfWeek Magazine. 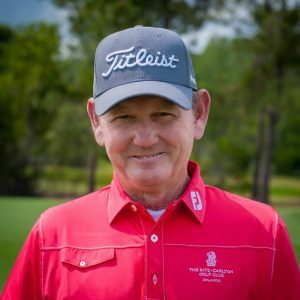 In 1981, he qualified for the PGA Tour at the last Spring School at Disney World with Payne Stewart, Denis Watson, Clarence Rose and Mark Calcavecchia. In 1984, he finished second at New Orleans, finishing 60th on the season’s money list. Larry would make the top 125 the next ten years and 12 times overall. His best year was 1985 when he finished 30th on the money list, had six top tens, and led the Tour in Eagles. He also led the PGA Tour in putting in 1990. Larry is considered by his peers to be one of the game's best short game coaches. He has 525 PGA Tour starts with 283 made cuts. Larry spends the winter teaching golf in Orlando, Florida at the Ritz-Carlton Golf Club and the summer at Red Sky Golf Club in Wolcott, Colorado as the Director of Instruction. He is also a Sirius XM Radio Host on his own show, “Rinker’s Golf Tips" (Saturdays/Sundays, 9-10am ET - Sirius 208 Xm 92). Check out what Larry had to say about his career, achievements, and experience with FlightScope. LR: 2015 Xi-tourFS: What product(s) do you currently use and why? LR: X3, best launch monitor on the market. V1 Sports, Canon camera, Boditrak, Blast Motion, FocusBandFS: What is it about FlightScope technology, products, and the company in general that has made you a loyal user? LR: Quality of people, product, and supportFS: What is your favorite golf course? LR: Pebble BeachFS: What is your favorite club in your bag? LR: PutterFS: What other hobbies do you have outside of golf? LR: Professional guitarist. Taking online course at the Berklee School of MusicFS: Who is your favorite golfer of all time? LR: Bobby JonesFS: Are you a fan of any other sports? Who are your favorite teams? LR: Football - Miami Dolphins, Denver Broncos, and die hard Gator fan of all sports!FS: What accomplishment(s) are you most proud of? LR: That my three children are doing great; Won 1985 J.C. Penney Mixed Team Classic with my sister Laurie; played in the final group of the US Open on Saturday 1982 with Bruce Devlin; Finished T-15th which got me into my first Masters and another US open; 525 PGA Tour starts with 283 cuts made; I’ve been able to transition into a teaching career and very blessed to have two great places to teachTo learn more about Larry, visit larryrinker.com.